The number of China enterprise email users was estimated to reach 112 million in 2016 and is expected to reach 135 million in 2017 according to iResearch. 92% Chinese use smartphones ‘all the time’ according to WBR Digital. 70% Hong Kong consumers have bought something as a result of receiving a marketing e-mail. China’s mobile internet users reached 901 million as of September of 2015 according to China’s Ministry of Industry and Information Technology. The mobile e-mail users in China have reached 250 million based on the latest report of WPS. 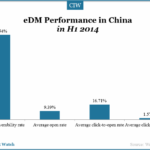 Webpower recently released China email marketing industry report, showing overall development and industrial application status quo. The report provided four EDM (email direct marketing) indexes for analysis. Email user coverage in China was 125 million, far less than online shopping and search engine. But the average visit duration was 79.6 seconds, longer than online shopping and search engine. 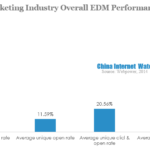 Web Power, an email marketing service provider with a presence in China, shared some data of average EDM performance in China in 2011. Email deliverability in China is much worse than the global average; only 58% of all emails can reach users’ inbox, which is also much lower than the average in Asia Pacific region (78%) according to data shown in a recent ReturnPath report.